Attachment of the viral proteins to host receptors triggers lipid-mediated endocytosis of the virus into the host cell. ASSOCIATED DISEASES JCPyV (Human polyomavirus 2): progressive multifocal leukoencephalopathy (PML ). 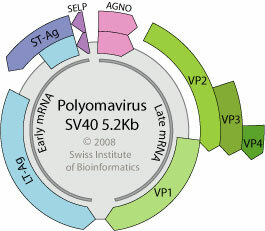 BKPyV (Human polyomavirus 1): mild respiratory infection. ASSOCIATED DISEASES JCPyV (Human polyomavirus 2): progressive multifocal leukoencephalopathy.